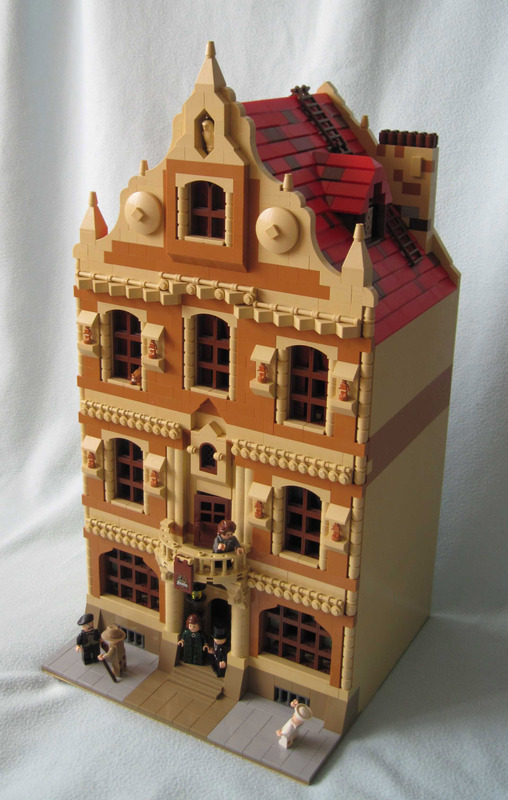 Brick Town Talk: Spit and Polish - LEGO Town, Architecture, Building Tips, Inspiration Ideas, and more! Poland - (BTT) This tenement building, taking its name from the owl in the crown, is never at a loss for renters. The immaculate exterior has never looked better, proving this building possesses that rare feature few apartment hunters ever see - a landlord that actually cares. Thanks guys! I can't tell you enough how much I wish dark orange would be made more available. Katie: I too like to link to flickr when possible, or at least a site that allows comments on it. I didn't see this anywhere but Brickshelf, sadly. Oh, and please please please think about trying your hand at making a modular! Chris: I agree completely, I would love to see other colors like dark tan, sand red, and dark brown in a greater number of pieces. Medium dark flesh is a decent substitute for dark orange and is now pretty cheap to get a lot of bricks in it - I've done two builds using it including my theater - but I think the hardest thing about doing a new building is finding a color scheme that looks realistic while still different from everything else.